“Doctors in Florida who pronounced me ‘soon-dead’ can’t believe that I’m healthy today,” said Hadassah melanoma patient Stewart Greenberg. 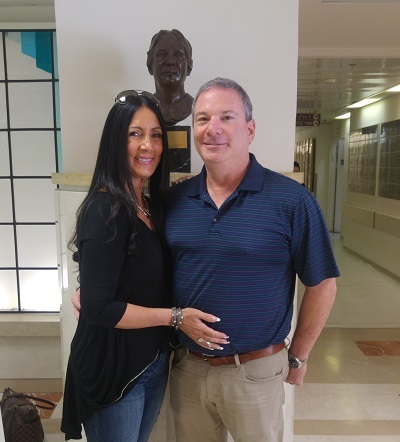 Standing with his wife, Maggie, in front of the famous statue of Hadassah’s founder, Henrietta Szold, who asked that her eyes “look to the future,” Mr. Greenberg is enjoying his future thanks to treatment at the Hadassah Medical Center in 2012 when he was diagnosed with stage four melanoma. Although medical centers in the United States could offer him no hope, Hadassah’s Dr. Michal Lotem, head of the Center for Melanoma and Cancer Immunotherapy, successfully treated him with her individually tailored melanoma vaccine.